This technique has been practiced in India for thousands of years, and was originally used as a technique to keep long hair thick, and in healthy condition. champi means head massage derived from the word shampoo. 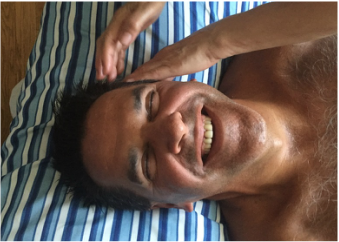 However the modern Indian Head Massage technique has advanced to include the upper back, shoulders, neck, upper arms, scalp and face. IHM (Indian Head Massage) has been practiced in the UK & Europe for over the last 10 year, utilizing the best elements of head and body massage. This method is particularly beneficial to people who are desk bound, office workers, computer technicians, people that drive long distances, Nail tech, Tattoo artists, anyone in the service industry that experience pain and tension in these areas. 1. Reduces & releases stress throughout the body; Indian Head Massage particularly effective in addressing the effects of stress. The treatment can induce a felling of euphoria and provide a sense of deep relaxation, well being and tranquility. 2. Increases blood supply, nourishment and oxygen to hair follicles, thereby improving the texture and strength of hair and hair growth, as well as toning of scalp muscles. 3. Free knots of muscular tension and relaxes connective tissue and scalp muscles providing relief from aches and pains. 4. Helps relieve neck and shoulder stiffness, sinus congestion, eye strain, jaw-ache. 5. Reduces and relieves tension headaches and migraines. 6. Aids insomnia, giving more restful refreshing sleep. 7. Improves circulatory, muscular and nervous system. 8. Revitalizes and re-balances energy flow throughout the body.